This entry was posted in Conventions and tagged Brendan Reichs, Bryan Brandenburg, Dan Wells, Daniel Jose Older, FanX Salt Lake Comic Convention, Gwenda Bond, Howard Tayler, Justine Larbalestier, Shannon Hale by Mike Glyer. Bookmark the permalink. Too little, too late. It took them 3 weeks to put that out? There’s no excuse for posting her email address, about any topic. Fire Brandenburg and borrow an anti-harassment policy from a con which has a clue. If Brandenburg understood what he did wrong, he’d be resigning for the good of the con. He doesn’t, and FanX doesn’t care. I hadn’t an inkling about this until someone posted it to Arisia slack a couple of hours ago. Nasty. I hope they learn from this, but they sure have a long way to go. ‘… “John Barrowman will gladly hold your buttocks in your Photo Op. … Stephen Amell will hug you tight at his signing booth,” he assured fans on Facebook last week, while sharing the new policy. Anyone else notice this part in the extended “apology”? After today’s events, I admit that I am not fully aware or educated about the importance of the #metoo movement, and this is something I am actively working to change. I need to improve on listening and making people feel validated. #metoo is not a difficult concept. It’s not hard to grok. All one needs to do is recognize that people are individuals who get the final say on who gets to touch/proposition them and how, rather than playthings to be pawed at the whim of anyone who feels like it. Speaking of feelings, check that last sentence: “I need to improve on listening” (so far, so good) “and making people feel validated.” Not actually taking them seriously, mind – just making them feel like he is. Dude, real talk – put the shovel down! @Rev. Bob: my thoughts exactly. If “don’t harass people” is too difficult a concept for him, someone else should be in charge of responding to harassment complaints. The one thing I find really disingenuous is that in the conventions doxing-tweet, they had edited out the most incriminating part of the mail to Hale, i.e the one you can see at the top of Hale’s first tweet in the article above. Rev. Bob: FanX, going by the articles I read this afternoon, has made a complaint-driven response. Which is a sign of people who don’t have consistent values, and are bound to get into trouble trying to do just enough to neutralize criticism, never really embracing that there is a problem or having a desire to fix it. @ Hampus Exactly. Both dishonest and stupid, they know other copies of the email exist. He announced a new anti-harassment policy that promised a fun environment of touch? First he says that he has cared about sexual harassment issues since before it became “trendy” (the #MeToo movement). Then he says he’s not fully aware of the importance of the movement. Seems to me if he was really that attentive to the importance of sexual harassment for so very long (before #MeToo became an active conversation) then he would have immediately seen the importance of the #MeToo movement as soon as it began without needing further education. rcade – Worse than that, he announced a new anti-harassment policy that promised an environment of requiring their guests to touch whenever they’re asked to. Yes. If Stephen Amell does not feel like hugging or John Barrowman decides he won’t grab buttocks today that is their right too and being paid to do photo ops with fans does not waive their rights to decline kindly. Welp, that policy of touch required if ssked is probably the stupidest thing I’ve seen all year and it’s not even June. Every person who runs a SF/F convention needs to be educated on how to draft an anti-harassment policy and properly handle harassment complaints. Whether they learn this kind of thing at SMOFcon or someplace else, it is critical to avoiding the kind of long-term reputational damage that FanX is doing to itself by how it has treated people since complaints arose. One thing I wish cons would to is designate one person to speak for the organization about harassment policies or a reported incident. 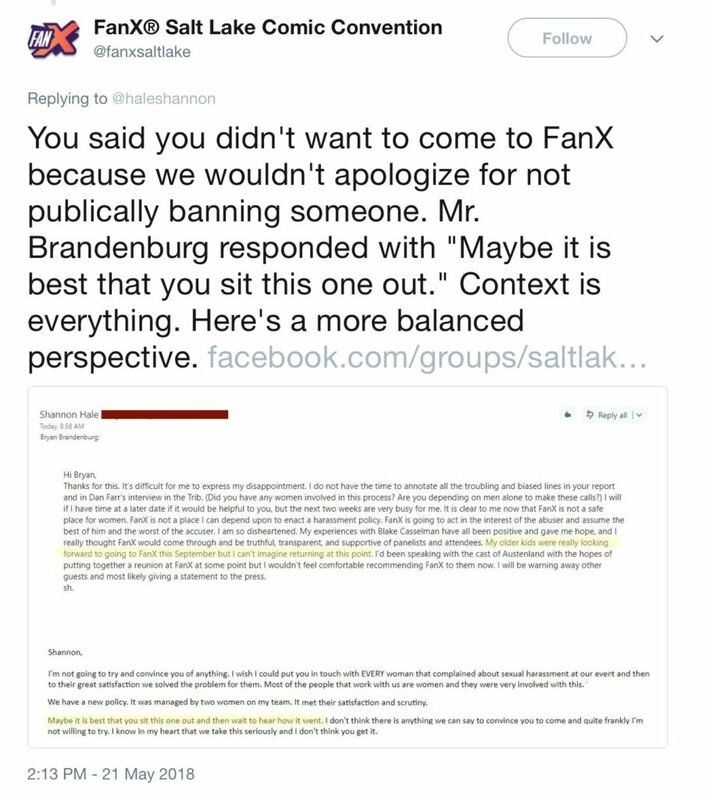 When something becomes a controversy and multiple con organizers speak out, it seems like there’s always at least one who does what Bryan Brandenburg is doing here and makes things worse, by demonstrating insensitivity or indifference to the problem, criticizing people who made a complaint or committing some other gaffe. This person should also be the only one making an official statement on social media. @rcade: It is also critically important that it is the right someone or someones who work on handling harassment or similar complaints, or speaks for the organisation. Having someone who lacks empathy, good judgment, or knowledge in charge of these issues means the organisation is set up for disaster. I keep reading FanX as FauX. My eyeballs apparently can commit Freudian slips. Yet SO MANY white men* in my life have entirely failed to harass me. Amazing, isn’t it? It’s like it’s NOT HARD or something. The awesome men I know just make it look EASY to tell the difference between a mutually agreed upon hug or backrub and an unasked for groping. And on the rare occasion when a cue was misread and a hug or kiss was not supposed to happen, or a friendly joke slipped a bridge too far, they *learn* and *don’t do it again*. It’s like communication and respect are possible for normal people. * and non white men, and women… *I* qualify as one of the ones who committed an act of sexual harassment, grabbing a guy in a way unasked. Apologized. Will never do it again. Won’t pretend it didn’t happen because if I do I might also forget the lesson not to do it. SL Trib: Evans told The Tribune he is “repulsed” by the accusations, adding that, in the 2017 incident, the woman misinterpreted his friendliness. I don’t know how “you’re touching me without my permission, and I don’t want you touching me” can possibly be a “misinterpretation” of anything. This guy needs a cluehammer.